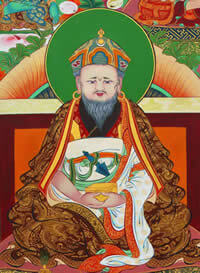 Rigzin Terdag Lingpa (1646- 1714) was the speech emanation of the great translator Vairocana. At the request of the dakinis, the body of his pristine cognition assumed the form of Heruka and Terdag Lingpa, accompanied by rainbows and various wondrous omens, was born on Monday, March 26, 1646 (tenth day, second month, Fire Dog Year). Known as one of the greatest Tertons of Tibet, this great treasure finder discovered numerous profound termas and worked tirelessly to preserve and spread the dharma throughout Tibet. Many precious teachings, on the brink of being lost, were compiled and restored under his guidance. He authored a magnificent treatise, the Terchen Kabum (collected works), containing expositions on the various branches of studies of Tibetan Buddhism in sixteen volumes and also compiled texts such as the bdud ‘joms bum bzang, a collection of various empowerments on which the Great Terdzod was later based. Terdag Lingpa transmitted the precious teachings to numerous fortunate students who gathered before the great master, drinking the nectar of his speech. Foremost amongst his personal disciples was the supreme conqueror, the precious Fifth Dalai Lama with whom he shared a patron-priest relationship. Of the great famous masters in that period, there seem to have been none who did not supplicate him. This great treasure finder worked tirelessly to preserve and spread the dharma throughout Tibet. He established Og Min Ogyen Mindrolling Monastery in 1676, ensuring the continuation and preservation of the profound Nyingma teachings.